The sky is (literally) the limit in Atlanta’s apartment market, with everything from towering high-rises to sprawling tree-lined complexes offering features that will whet the appetite of any discerning apartment-seeker. But developers of Atlanta’s most enticing apartment complexes recognize that the outdoor features they offer are just as important as indoor features. They know that potential residents will look past the typical courtyard, tennis courts and swimming pool for more extravagant outdoor amenities. Typical tenants in Atlanta say they expect to entertain groups of friends or family outside their apartments, so attractive gathering spaces and activities are especially appealing. 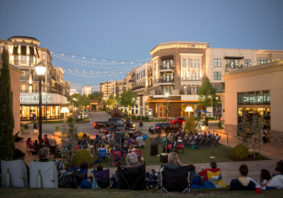 And, as workers in Atlanta tap into flex-time benefits and work-from-home opportunities, beautiful and functional outdoor surroundings, with plenty of close-by entertainment, shopping, dining and recreation, have become integral to their lifestyle. In fact, next to a rooftop deck, a recent study by the National Apartment Association shows that pooch-friendly facilities are in the top-five most sought-after attractions for Atlanta apartment-seekers. For instance, Morningside Atlanta by Windsor takes its dog-centric amenities one step further, with grooming stations (complete with soap and dryers) and a shaded pet park featuring an automated turf-sanitizing spray that “wipes the slate clean” before your pooch comes out to play. Developers supply more bang for tenant’s bucks with features like outdoor terraces with fountains, fireplaces and sleek modern furnishings, such as those found at Midtown’s Sky House South. For those who enjoy upscale alfresco dining, shaded outdoor kitchens with grills can be found at many complexes. 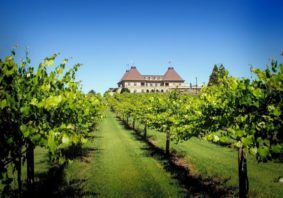 Some even go the extra mile with features like Big Green Eggs or weekly onsite farmer’s markets. Many apartment and condo complexes are built above a “retail anchor” that appeals to their specific tenant target market – like the Morningside Atlanta development, perched atop a 27,000-square-foot Sprouts organic market on its ground floor, which appeals to resident foodies. Those same foodies will appreciate outdoor amenities at Cumberland’s Encore Apartments (near the new Braves’ stadium), featuring a demonstration kitchen with garage-style doors opening to a patio complete with sleek, modern dining furniture. 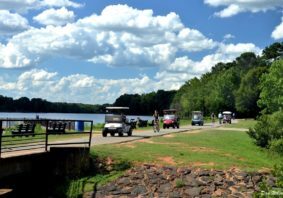 The close proximity of many apartment complexes to Atlanta’s public green spaces, hiking trails and historic parks creates a unique opportunity for city dwellers to experience the great outdoors without even getting in their cars. For instance, the Alexan on Krog not only is situated right on the city’s famed BeltLine greenway, but it also offers community bike shares and a self-serve bike shop for last-minute repairs. “Most people looking for corporate relocation here name walkability as a priority,” Miller says. “They want to be able to access grocery stores and restaurants easily by foot.” For example, AMLI Ponce Park, adjacent to Historic Old Fourth Ward Park, is ideal for tenants who crave access to the outdoors and want to take Fido along to the restaurants and nightlife a short walk away at Ponce City Market. 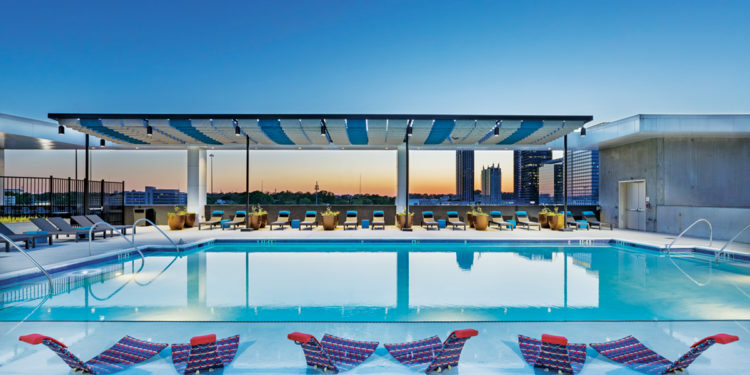 For university-bound tenants, campus-area apartment complexes offer swimming pools with TVs and WiFi access, but some go above and beyond, like University House Midtown near the Georgia Tech campus, which sports a poolside Jumbotron that’s perfect for serious game day pool parties. To check all the undergrad boxes, the building’s ground floor is also home to an all-night cookie-delivery service, Mexican fast food and a smoothie shop. 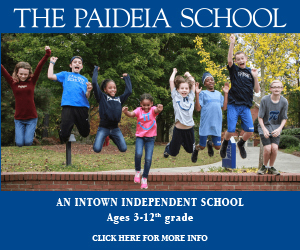 All over Atlanta, students can choose from a multitude of apartment locations with easy access to public transportation, or, for students with their own wheels, secure parking with onsite car washes and car-charging stations. Young parents looking for more family-friendly options flock to complexes like Avalon Park in Collier Heights, which offers garden-style apartment homes built in clusters surrounding kid-friendly amenities like picnic gazebos, playgrounds and clubhouses with after-school programs for children. Developers see the merit in appealing to downsizing empty nesters too. 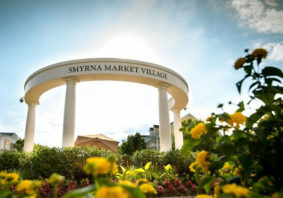 Resort-style heated saltwater pools, putting greens, bocce ball courts (like the ones at Accent Waterworks near Atlantic Station or Avana Uptown), dedicated outdoor yoga studios, Zen gardens with fountains and lush landscaping (like the Elle of Buckhead) or personalized garden beds attract tenants with more time for relaxation and entertainment. 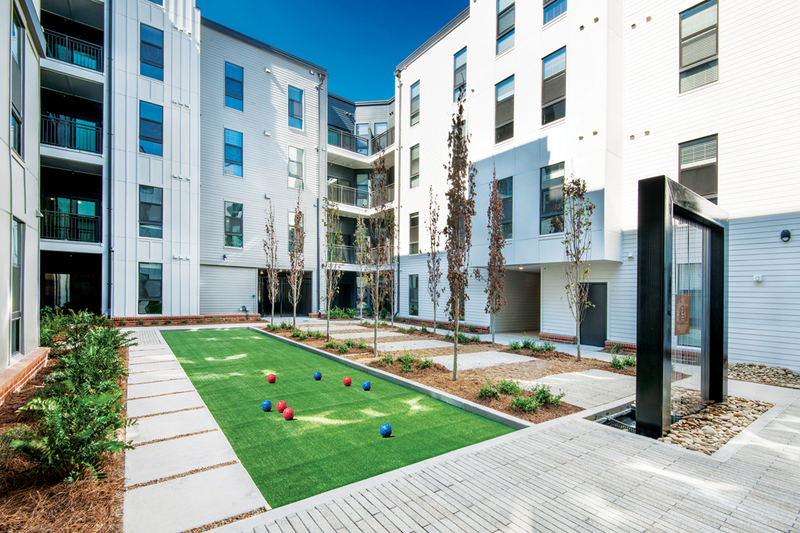 So before you settle for the typical pool-tennis-gym amenity combo, check out the over-the-top outdoor amenities provided by forward-thinking apartment complexes that are designed to entice potential residents to sign on the dotted line.